Plot: The storyline follows 17 year-old Taylor who receives a computer on her birthday. She is excited to meet new friends online until she becomes the target of bullies on a popular social website. Her life changes quickly to one of fear, frustration and depression. Upon learning that she is not alone, including a classmate who suffered a similar experience, Taylor rebounds with the help of her mom (Don’t miss ABC’s Family movie “Cyberbu//y” on July 17th, 2011). 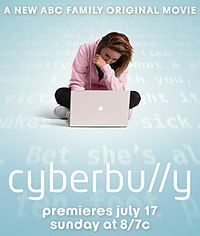 Cyberbully (stylized cyberbu//y) is a television film that premiered on July 17, 2011 on ABC Family. ABC Family worked with Seventeen magazine to make the film, and hopes it will "delete digital drama". The film tells the story of a teenage girl who is bullied online. It was filmed in Montreal. The film will be released on DVD February 7, 2012 (Wikipedia).